Made in Spain - TEE LOVERS 70, S.L. Seventees was born from the desire to create cottons with character and personality, fleeing mass production, globalization and uniformity. Seventees approaches a casual woman, open minded and young at heart: no matter the age of the DNI. Connect women in love with fashion, who love care, travel and new experiences and emotions. A profile that is looking for funny, cool clothes and be different. The brand name is very catchy and conceptual: it is based on the union of the "seventies", because it is the decade in which was born his creative and being a decade of musical and cultural boom, icon of freedom and hippie movement along the anglicized to shirt “tee”. Seventie’s + tee. 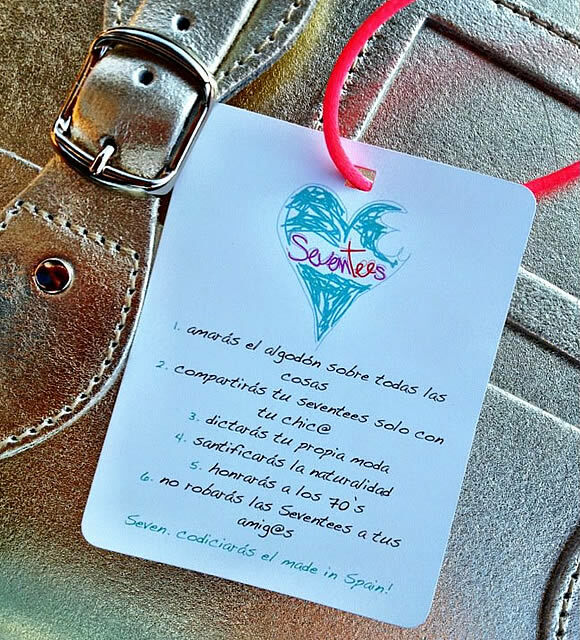 Seventees is 100% made with love in Spain, respecting nature and human beings in all phases of production. All the garments have a handcraft dyeing process. Seven · Codiciarás el made in Spain!